Additional Information complete w/ box, papers, second back etc. 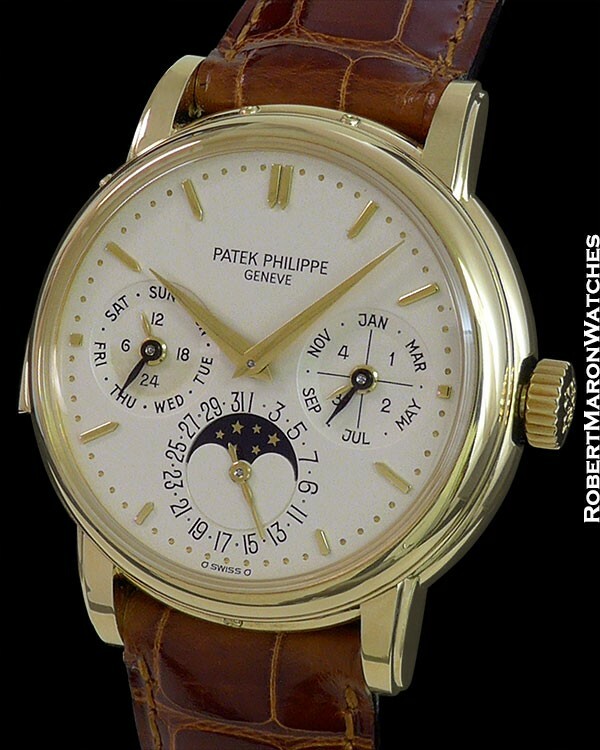 Here is one of Patek Philippe's most important and treasured watches: the minute repeating perpetual calendar reference 3974. Even for watch dealers, the occasion to see and admire such an exceptional horological object as the reference 3974 is rare. 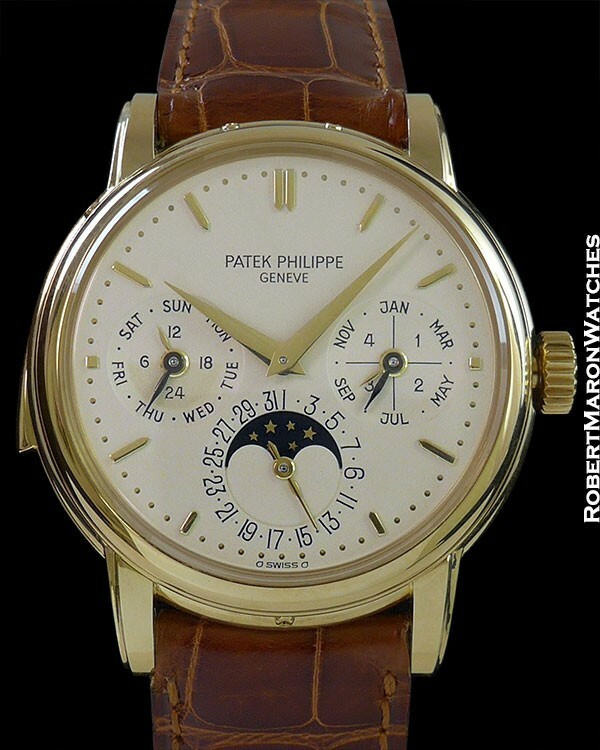 As far as minute repeaters are concerned - Patek Philippe is the most hallowed… As far as models are concerned - the 3974 is the most coveted. 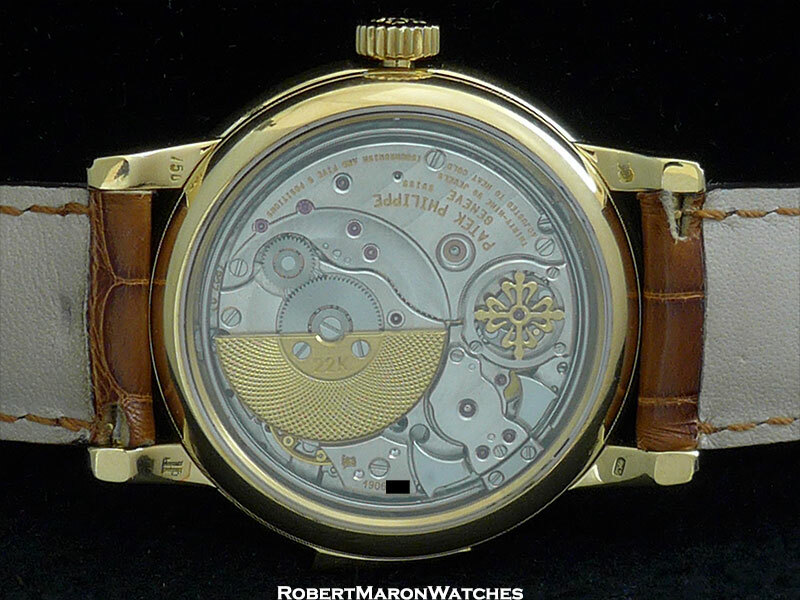 Automatic…perpetual…and minute repeating--all housed in a massive Calatrava case. Patek produced the 3974 between 1989 and 1997, and the model marked Patek’s 150th Anniversary. Production was low. It is said that each 3974 took four years of development and assembly. The 3974 is THE Holy Grail wristwatch. Case is 18k gold with dimensions of 36mm diameter by 12mm thick. Sapphire crystal in front and display back. 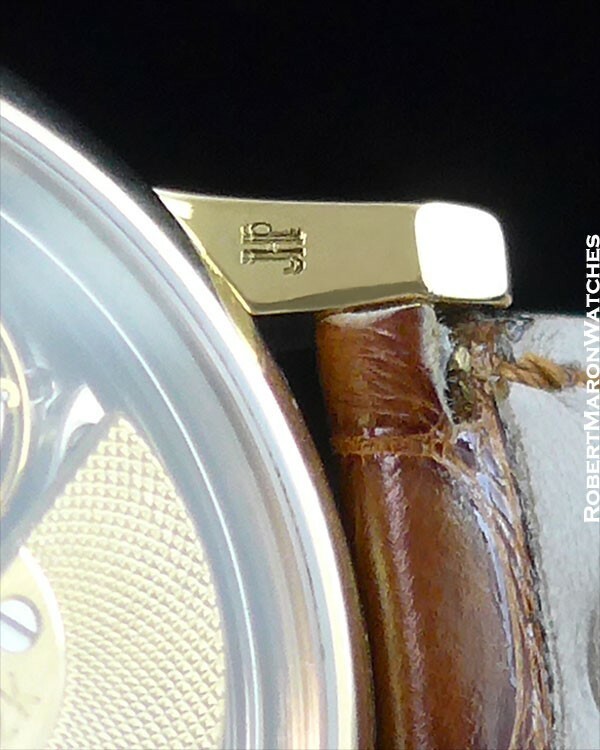 The case was made by John Pierre Hagman, Patek Philippe’s and Geneva’s most celebrated and revered case maker. Mr. Hagman is so important and highly regarded he has his own hallmark: JHP used on the cases that he makes. Importantly, Mr. Hagman did not make all 3974 cases, only a handful of them. The reference 3974 is the last minute repeater watch with Hagman cases. Dial is solid gold, silvered, and with applied hour markers, embossed minutes chapter, and dauphine hands. The subdial at 3 o'clock displays month and leap year cycle. Subdial at 6 o'clock displays date and moonphase. Subdial at 9 o'clock displays day and 24 hour (am/pm) time and is shaded to represent night time between ‘18’ and ‘6’. Movement is the automatic winding Patek Philippe Caliber R 27 Q. Movement features 39 jewels, self-compensating free-sprung balance adjusted to heat, cold, isochronism and in 5 positions, and stamped with the Geneva Seal. The caliber also features a 22k micro rotor with hand guilloche. The minute repeater's hammer and gongs can be seen through the display back crystal. Movement is constructed from 467 individual parts.